“Blessed be the God and Father of our Lord Jesus Christ! According to his great mercy, he has caused us to be born again to a living hope through the resurrection of Jesus Christ from the dead, to an inheritance that is imperishable, undefiled, and unfading, kept in heaven for you, who by God's power are being guarded through faith for a salvation ready to be revealed in the last time” (1 Peter 1:3-5). Today was the last day of the 2010 Sola 5 Conference. The programme was to run only up to lunch so that those who needed to travel out of Zimbabwe could get to the border before it closed. Our meeting commenced with spontaneous singing again at about 09.15 hours. We sang “A debtor to mercy alone” and “Before the throne of God above”. I was asked to lead this final meeting, which was a great pleasure. The final day is the "sweet course" of any conference! 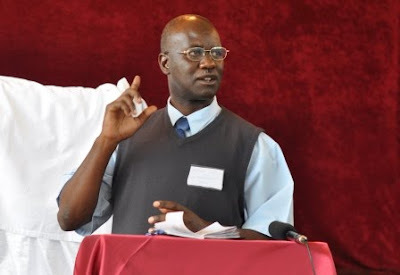 Kennedy Sunkutu (shown below), the pastor of Kafue Reformed Baptist Church, gave the Zambian missions report, which covered the period since our last Sola 5 Conference in September 2009. 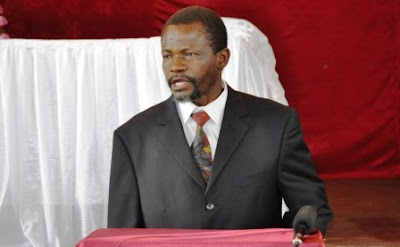 He began with the bad news of the ending of two pastorates, in Botswana and Ngombe (Lusaka). He spoke about the new outreach efforts in Ethiopia and Uganda. 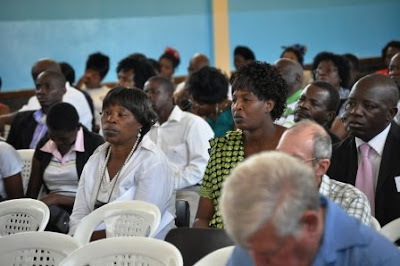 He also reported on the ordination of three missionary pastors—in Katete, Chipata and Mansa—and the new church plants in Solwezi, Chipulukusu and Lubuto. As for the urgent needs, Kennedy specifically mentioned the need for church buildings. 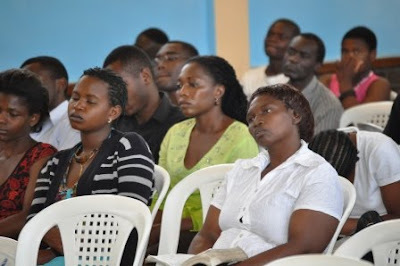 He also shared on the internship programmes which are helping to prepare younger men for pastorates. 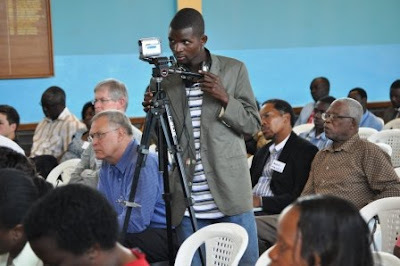 Apart from the national Reformed conference, which had become international in scope, he also reported on regional (provincial) conferences in the Eastern and Southern provinces of Zambia. 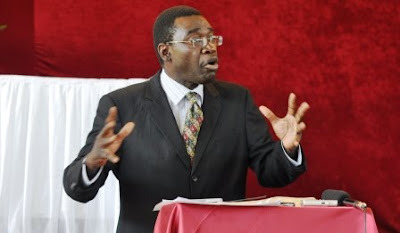 Finally, he spoke of two churches that are now autonomous—in Kafue and Livingstone. Since it was a Sunday worship service, we took an offering which was going to go a long way in helping with the costs for the conference. After that, Christo Beetge prayed for both the offering and the Zambian missions report. I read Ephesians 1 before introducing Victor Kanyense as the preacher of the day. Victor preached on “The Steadfast Nature of the Christian’s Enablement”. (1) The hope to which Christians are called. The Gentiles were hopeless outside Christ before their conversion. It is the same today for all who are without Christ. Yet, it is the exact opposite for the Christian. There is light in the valley of death for us. There is certainty as far as the future is concerned. How we live the Christian life is determined in large measure by how we think about the future (e.g. 2 Thess 1:11-12, 2 Peter 3:11-13). Christians are never too heavenly minded to be of any earthly use. Sadly, we are often too earthly minded to be of any use to God in this life! (2) The riches of God’s glorious inheritance in the saints. In the OT the nation of Israel was regarded as God’s inheritance (e.g. Psalm 28:9, Malachi 3:16-17). Even the Promised Land was given to them because of this. Hence, God was also their inheritance. Paul uses this imagery for the New Testament church. We are God’s treasured possession. We must never take this for granted. This is why God protects his possession (1 Peter 1:3-5). This is what makes Christians willing to give up so much for the sake of the kingdom of God (Hebrews 10:34). (3) The immeasurably great power of God towards those who believe. Paul knew that the believers in Ephesus were surrounded by powerful cults. They needed to see that the one who was in them was mightier than the one who was in the world. Hence, Paul prayed that they may know this power in an experiential way. This power is expressed in Christ’s resurrection, his ascension and his dominion of all powers across history and in eternity. This is the same power that presently works for us as believers. Christ being at the right hand of God echoes Psalm 110:1. He towers over sin, Satan and death for the sake of the church. We need to see this, especially when we are in the midst of personal trials. Victor said in conclusion that this is what it means to belong to Christ. This is God’s grace for today. He has given grace sufficient for all our need. This is where our security lies. Christ cares for his own body and rules the universe for us. With those concluding words, Victor led us in a closing prayer. I asked the congregation to sing the hymn “Before the Throne of God above” before we had the final announcements and the benediction. 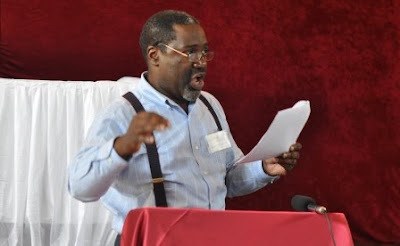 Joseph Soko (shown above), the host pastor, expressed hearty thanks to all of us for coming to Zimbabwe despite their many economic and political woes. It was a great encouragement to their church. That is how the 2010 Sola 5 Conference came to an end. Due to public demand, we took a group photo at the very end of the conference. It was not a fair representation of the attendance because a number of people had already left, but, as they say, half a loaf is better than none! To God alone be the glory. Amen! Will the sermons be available for download? I will find out and write a further comment once I have some answer. Thanks for asking! I noticed someone inquired about the conference sermons: They are available at www.sola5.org. Thanks for the running commentary and trove of insight. It's just like being there! Now off to the Sola5 website to collect at least one sermon to listen to tonight! To be there, to be there; Oh, what must it be to be there..!